Casinos are cash-based industries that rely on physical controls and strict documentation procedures in order to safeguard large amounts of cash and chips. One of the most critical areas of casino security where these controls come into play is key management. Physical keys are used for access to virtually all of the most sensitive and highly secured areas of the casino, including counting rooms and drop boxes. By maintaining tight control of keys with sophisticated key control and management systems, the casino can minimize incidents of loss and fraud for these and other sensitive areas. Genesis Resource, Inc., a leading provider of Morse Watchmans KeyWatcher® electronic key control systems to the casino industry, has firsthand experience in understanding how important key control systems are to a casino’s security operation. They know where and why key control systems need to be placed; they know how they are used and who uses them; and they stay aware of the various regulatory and licensing commission regulations that must be met. Their clients include most of the casinos in Arizona, Nevada and New Mexico. Genesis established their business in the gaming market with the casino’s slot departments, which led to controlling access to sensitive drop box keys, counting room keys, and drop box cabinet keys. With a Morse Watchmans solution in place, these keys and key sets are secured in a KeyWatcher key control cabinet that will not open until the system verifies that the user has permission for the specific key(s) requested. All other key sets remain locked in place. Since key sets for counting rooms and drop boxes are highly sensitive, gaming regulations generally require the three man rule to access key sets – one person each from three different departments is required to log in. Typically the three individuals would include a drop team member, a cage cashier and security officer. Often the KeyWatcher is either located in the cage mantrap or chip bank area, with a secondary combination remote keypad and display console located inside the cage to allow cashiers to log in without leaving their workstation. The Morse Watchmans system is programmable to recognize specific keys or key sets and only open the cabinet door and release them once the three required logins are complete and the credentials verified. As a user convenience, KeyWatcher will prompt for the additional logins only once, regardless of how many sets were initially requested. A non-disputable key control log is maintained to substantiate control over the keys. One of many reasons KeyWatchers are so widely accepted is because they exceed the level of security offered by manual log systems. Access to table game drop box release keys is limited to the specific employees who are authorized to remove the table game drop boxes from the tables. A different set of employees would have access to the unscheduled drop sets, and the KeyWatcher system can be configured to reinforce this safety procedure. Individuals are precluded from having access to table game drop box content keys at the same time they have the table game drop box release keys out. 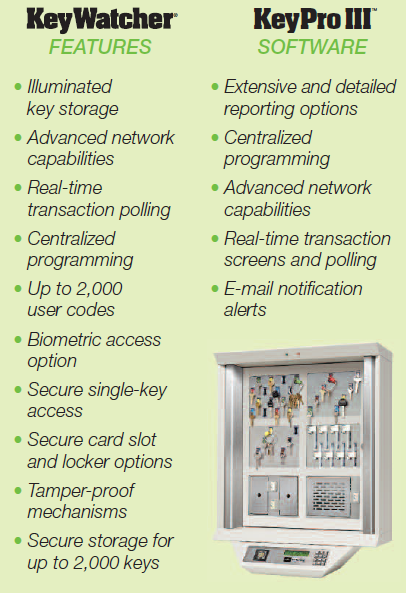 In emergency situations such as machine jam, customer dispute, machine relocation or maintenance, where key sets must be accessed outside of regularly scheduled times, the KeyWatcher cabinet can be pre-programmed with “notes”. Before a key is released, the system will prompt the user to select a predefined note plus enter a freehand comment indicating the affected machine and table numbers. Outside of special key access or emergency situations, it is useful for certain keys or key sets to be immediately available to their authorized users. With the KeyWatcher instant key release feature, the user only needs to input their credentials, and the system knows whether they already have their specific keys or not. If not, the system unlocks and their keys are immediately available to them. Returning keys is just as fast and easy with KeyWatcher. This saves time, reduces training and helps to overcome any language barriers. Another convenient feature of the KeyWatcher utilized frequently by casinos/resorts is key cycling. Casino/resort staff including housekeepers and slot floor attendants can be organized into “groups” by the system administrator. For these individuals or groups, the hotel and casino has multiples of the same respective key sets available. The KeyWatcher can be programmed to release the next available set to each authorized user from a group, which cycles through the sets so that each gets equal usage. Gaming regulations require a number of different types of audits on a regular basis to assure the casino is in full compliance with regulations. For example, for employees signing the table game drop box keys in or out, Nevada Gaming requirements call for maintenance of separate reports indicating the date, time, table game number, reason for access, and signature or electronic signature. An “electronic signature” includes a unique employee PIN or card, or employee biometric identification validated and recorded through a computerized key security system. Morse Watchmans key management systems feature software that enables the user to set up all these and many other types of custom reports, which can run and be delivered automatically to management on a regular basis. The robust reporting system will also greatly assist the casino in tracking and improving processes, assure employee honesty and minimize security risks. Auditors can be given access only to print reports, without access to key sets. Additionally, robust SMS text messaging and emailing allows for the key set user or select management to automatically receive alerts when specified key sets are removed and/or returned, along with select alarm notifications. With the advent of network systems and technology, Genesis reports a greater demand from casinos for key control systems that operate as an enterprise client-server application with a common user database. Since each system includes an unlimited site license, there are no site licensing fees to be concerned with. A common user database helps to ensure an employee’s HR-issued ID is recognized across all systems in an organization, which allows for auditing transactions and history even after an employee’s departure. This also makes it possible for the slots, cage and security departments each to have their own system, with users part of the same common user database but different access for each system. Using employee IDs also opens the door for optional 3rd party integration with existing card access control systems. For instance, when new employees are added, or terminated employees are removed from the access control system, they are automatically added or terminated in the KeyWatcher system. This integration can also pay dividends in terms of security policies and/or procedures as well as compliance with government agencies. Enterprise systems are highly scalable and key control cabinets can be distributed across the casino’s network to help relieve usage congestion. For example, at the start of a morning shift upwards of 500 housekeeping staff will need to access keys or key sets. By locating KeyWatcher cabinets adjacent to the areas where the keys will be used, bottlenecks in accessing/returning the keys can be avoided. 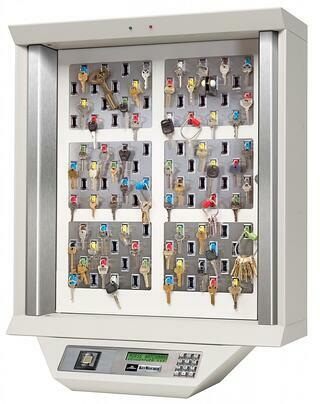 In another example, KeyWatcher cabinets can be installed at an employee entrance/exit door. When an employee leaves the building temporarily for a scheduled break, keys can be returned to the local key cabinet and then accessed again when the employee returns from the break. Casinos and other gaming establishments are 24/7 operations and as such need 24/7 support. However, quality of support varies from manufacturer to manufacturer and from dealer to dealer. Telephone support from Morse Watchmans is included with the system and Genesis supplements that support with extended warranties, after hours phone support, training and a variety of service/ maintenance contracts. 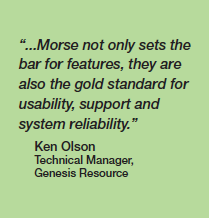 To further enhance their service offerings, Morse has offered free firmware and software updates for over a decade. Learn more about key control solutions for gaming.